After the excitement of the new Alfa Romeo Giulia, the company is now planning a larger model. The Giulia compact executive saloon hopes to unseat the BMW 3 Series from its position at the top of its sector. It's no easy task but the Giulia has been extremely well received and is a very interesting alternative to the rather predictable German options. Now Alfa Romeo has revealed the next stage in a major revamp of its line-up, in the form of a larger executive saloon aimed at BMW 5 Series fans. The Italian firm hasn't released any images as yet but has a history of creating absolutely beautiful cars so there shouldn't be any concerns about its aesthetic appeal. The new saloon will feature a new departure for Alfa Romeo, a six cylinder diesel engine, together with a plug-in hybrid and the same range of four cylinder petrol and diesel powertrains used by the Giulia. The 2.0 litre petrol model offers 197bhp in the Giulia but Alfa Romeo claims that there is plenty of potential to tune it for extra power, which could be useful in the new saloon. There's also the possibility of a hot Quadrifoglio model, again using the same engine as the Giulia, a V6 twin turbo unit with 503bhp. The Giulia Quadrifoglio goes on sale in the UK this October and will be priced from £59,000, making it competitive with the BMW M3 and the Mercedes-AMG C63, although the Alfa is more powerful than both of them. There are also rumours that the Giulia will set a new lap record for a saloon at the famous Nurburgring, and certainly a larger version of this would put the cat among the pigeons of the premium German brands. The rear wheel drive Giulia's flexible platform architecture will also be used for the larger car and you can expect to see the same six speed manual and eight speed automatic transmissions appropriated for the larger saloon. The UK market will probably only be given access to the automatic variant. In order to compete with the BW 5 Series and the Mercedes-Benz E-Class, prices should start at about £35,000 when the car is released in 2018, after the upcoming Stelvio SUV. 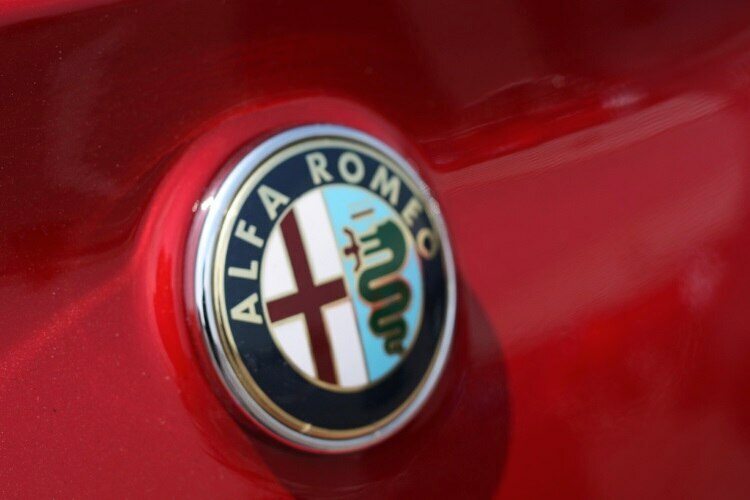 Alfa Romeo has hinted that some semi-autonomous driving technology will be included. The company is sticking carefully to a front engine, rear wheel drive format and an almost perfect 50/50 weight distribution for its newer models to rebuild its former reputation as a serious driver's brand. Alfa Romeo is hoping to have a completely new model line-up in place by 2020, with saloons and SUVs forming the core of the brand's business and backed up by a range of speciality vehicles for which the brand has become known. The smart driving Giulia is the first step in this strategy, to be followed next year by the firm's first SUV, the Stelvio. It too will be making use of the platform architecture and powertrains used for the Giulia. Alfa Romeo is also considering adding a smaller SUV to the roster. Later next year a new Giulietta hatchback will reach the market, replacing the current front wheel drive layout with a rear wheel drive format more characteristic of the iconic Italian brand and making it more competitive with the BMW 1 Series. In 2018 the firm hopes to have its larger saloon ready, together with a Giulia Coupe to reinforce Alfa's sporty image.